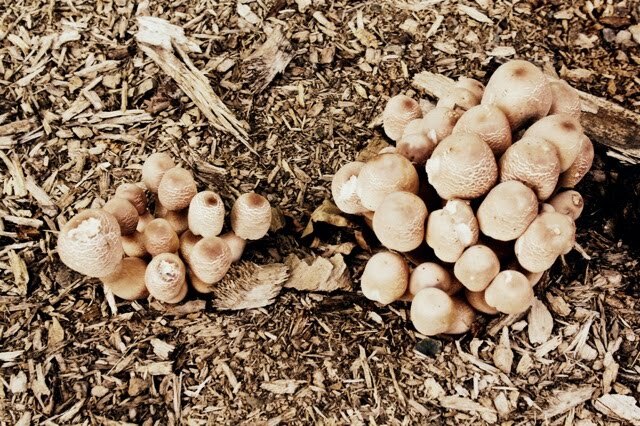 Summer is upon us with a vengeance here in the Hudson Valley, and it was with great delight that I discovered a virtual forest of mushrooms in our very own expansive backyard. And not one but two different kinds! Does anyone know what these are????? "When I first moved to the country, David Tudor, M.C. Richards, the Weinribs, and I all lived in the same small farmhouse. In order to get some privacy I started taking walks in the woods. It was August. 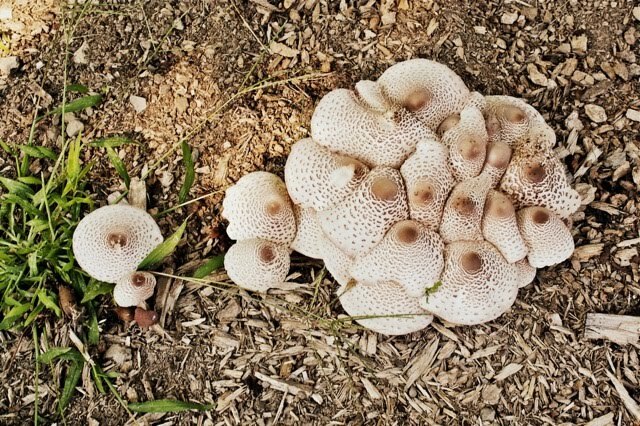 I began collecting the mushrooms which were growing more or less everywhere. Then I bought some books and tried to find out which mushroom was which. Realizing I needed to get to know someone who knew something about mushrooms, I called the 4-H Club in New City. I spoke to a secretary. She said they'd call me back. They never did. The following spring, after reading about the edibility of skunk cabbage in Medsger's book on wild plants, I gathered a mess of what I took to be skunk cabbage, gave some to my mother and father (who were visiting) to take home, cooked the rest in three waters with a pinch of soda as Medsger advises, and served it to six people, one of whom, I remember, was from the Museum of Modern Art. I ate more than the others did in an attempt to convey my enthusiasm over edible wild plants. After coffee, poker was proposed. I began winning heavily. M.C. Richards left the table. After a while she came back and whispered in my ear, "Do you feel all right?" I said, "No, I don't. My throat is burning and I can hardly breathe." I told the others to divide my winnings, that I was folding. I went outside and retched. Vomiting with diarrhea continued for about two hours. Before I lost my will, I told M.C. Richards to call Mother and Dad and tell them not to eat the skunk cabbage. I asked her how the others were. She said, "They're not as bad off as you are." Later, when friends lifted me off the ground to put a blanket under me, I just said, "Leave me alone." Someone called Dr. Zukor. He prescribed milk and salt. I couldn't take it. He said, "Get him here immediately." They did. He pumped my stomach and gave adrenalin to keep my heart beating. Among other things, he said, "Fifteen minutes more and he would have been dead." I was removed to the Spring Valley hospital. There during the night I was kept supplied with adrenalin and I was thoroughly cleaned out. In the morning I felt like a million dollars. I rang the bell for the nurse to tell her I was ready to go. No one came. I read a notice on the wall which said that unless one left by noon he would be charged for an extra day. When I saw one of the nurses passing by I yelled something to the effect that she should get me out since I had no money for a second day. Shortly the room was filled with doctors and nurses and in no time at all I was hustled out. I called up the 4-H Club and told them what had happened. I emphasized by determination to go on with wild mushrooms. They said, "Call Mrs. Clark on South Mountain Drive." She said, "I can't help you. Call Mr. So-and-so." I called him. He said, "I can't help you, but call So-and-so who works in the A&P in Suffern. He knows someone in Ramsey who knows the mushrooms." Eventually, I got the name and telephone of Guy G. Nearing. When I called him, he said, "Come over any time you like. I'm almost always here, and I'll name your mushrooms for you." I wrote a letter to Medsger telling him skunk cabbage was poisonous. He never replied. Some time later I read about the need to distinguish between skunk cabbage and the poisonous hellebore. They grow at the same time in the same places. Hellebore has pleated leaves. Skunk cabbage does not." And years later he gambled with the lives of many of us attending the 1989 "Composer-to-Composer Festival" in Telluride, Colorado, when he cooked up a batch he couldn't quite identify for a communal, post-concert dinner. We gobbled them down and, obviously, lived to tell. By the way, in case you don't know it, the Telluride Mushroom Festival is a very big deal in the Rocky Mountain West, being a celebration of "all things fungal & entheogenic" whose 30th annual just passed. Cage's personal library, housed here at the John Cage Trust, was full of books about mushrooms, many for use in the kitchen. 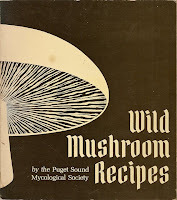 One of his favorites was this one here -- Wild Mushroom Recipes (1976), put out by the Puget Sound Mycological Society, edited by Pauline Shiosaki -- obviously pre-dating his devotion to macrobiotics. Look below for three randomly drawn recipes from this sweet little collection. Anyone interested in the subject will want to peruse the holdings of the John Cage Mycology Collection, gifted in 1971 by Cage himself to the University of California, Santa Cruz, and long lovingly administered by Rita Bottoms. Alas, the materials comprising this collection are not available online, but there is quite a bit of detail about what's there (photographs, correspondence, newsletters, historical records) should you want to consider a visit. And don't miss one of the most beautiful compilation essays written to date on the subject that appeared in a little-known magazine called Fungi (Volume 1, Winter 2008), entitled "A Plurality of One: John Cage and the People-to-People Committee on Fungi," authored by David W. Rose. Really, really good reading! This summer has been especially rich with travel, most of it for the sheer pleasure of attending Cage-related events in Europe. Since June, I've visited Newcastle, Florence, and Halberstadt, and while each of the host organizations and/or venues has fairly extensive expository Web materials to browse, I thought I'd share some unique photos, a few words about highlights, and some links. Each was lovely, in its own unique way. First stop, Newcastle, in the north of England, for the first of five venues of "Every Day is Good Day," the brainchild of Roger Malbert and Jeremy Millar brought forth as a touring exhibition under the auspices of London's Southbank Centre (where Malbert is senior curator). 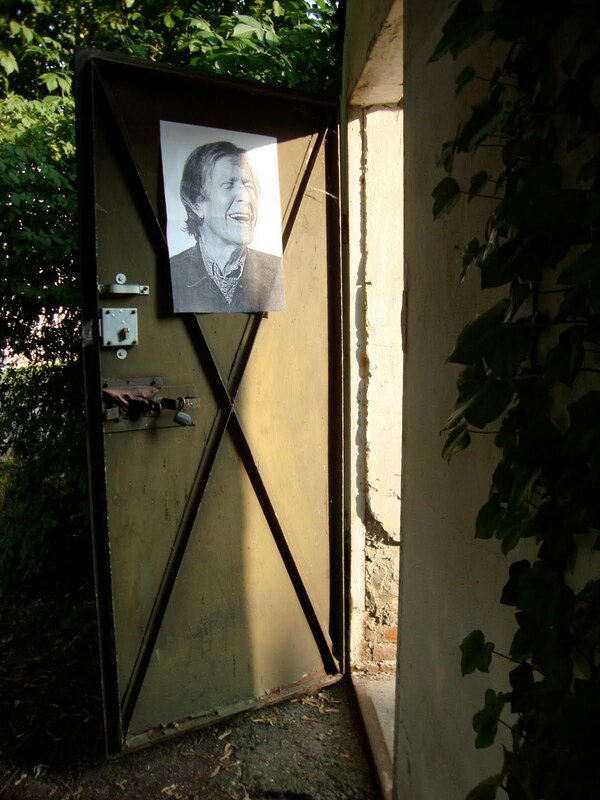 This is an exhibition deeply inspired by John Cage, since the use of chance operations determines the layout of the exhibition from venue to venue. More than 100 works, most borrowed from the permanent collection of the John Cage Trust and including drawings, watercolors, and prints, are seen in ever-changing configurations. And although the exhibition itself focuses on Cage's visual art, each venue is programming ancillary events that explore other aspects of Cage's practices -- music, to be sure, but also writings, dance, performance, and film. The exhibition catalog is the first to touch upon all aspects of Cage's work as a visual artist, and it includes more than 60 plates. It also incorporates a substantial extract from Irving Sandler's thoughtful 1966 interview with Cage on the subject of visual art. Newcastle's Baltic Centre for Contemporary Art is grand, and the collection breathes beautifully here. I especially loved its installation of Cage's HPSCHD (seen above). While the Baltic iteration closes on Sept. 5, others can be seen successively at Kettle's Yard in Cambridge (Sept. 25-Nov. 14), the Huddersfield Museum and Art Gallery (Nov. 20-Jan. 8), Glasgow's Hunterian Art Gallery (Feb. 19-Apr. 2), and the De La Warr Pavilion in Bexhill on Sea (Apr. 16-June 5). There may be a culminating event at Southbank itself, in September 2011, so stay tuned. Second stop*, Florence, for a lively "musicircus" (June 24, 2010) at the exquisite national museum of the Palazzo Vecchio. Imagine some 80 of Cage's compositions sounding variously (and simultaneously) throughout these hallowed halls -- really, one could only marvel at the sheer presence of electronic sound in the Salone dei Cinquecento! The event was entitled "Music Exposed" and involved roughly 40 musicians of the seasoned Flamensemble, headed up by Andrea Cavallari. Their performances ran for over eight hours (attended by literally thousands of people), which were beautifully captured by the remarkable photographer Riccardo Cavallari (incidentally, Andrea's twin brother!). Check out his slideshow here. *An asterisk here because technically my second stop was Lyon for discussions with Thierry Raspail, director of the Musee d'art contemporain de Lyon, about bringing France into the John Cage 2012 fold. With luck, more about this later in the year. Third stop, Halberstadt, to not only bear witness (July 5, 2010) to a note change in Cage's elongated Organ2/ASLSP in the Church of St. Buchardi but to execute it! While the work was launched by the John Cage Organ Project on Cage's birthday in 2001, this was my first visit and it was something of an epiphany. 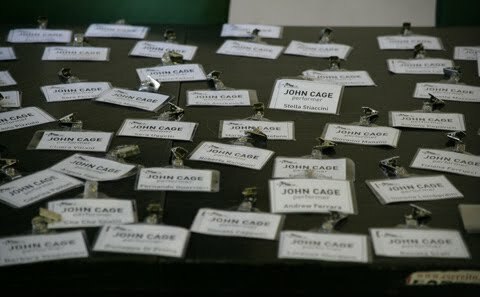 I usually arrive only for the bittersweet culmination of people's engagement with Cage, but in Halberstadt it was I who was ephemeral, since the work will be ongoing long after any of us is here to witness. It was an extremely moving experience -- as much for the people involved as for the sounding of the work. And in case you missed it, here's Daniel Wakin's piece as it appeared in the New York Times (2007), sweetly entitled "An Organ Recital for the Very, Very Patient." The image just above, by the way, is of the gateway to a garden situated behind the home of one of the key participants of the John Cage Organ Project, where many meals were shared. In my experience, such gathering spots are critical, since they not only provide necessary respites for weary travelers, but the even more necessary space to communally reflect and converse. I am reminded of the many, many impromptu late-night, post-concert suppers at the Cage-Cunningham loft, for which I will always be grateful. New York City can be a lonely place without them.